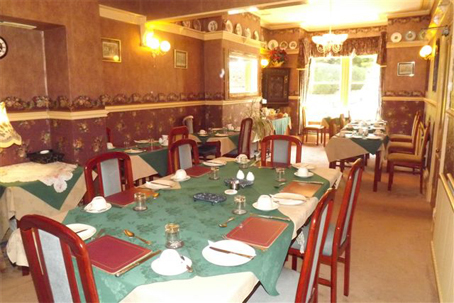 The breakfast room has a very warm and welcoming atmosphere. Guests may wish to relax in the licensed bar which is located at the back of the breakfasst room or perhaps sit at their table and admire the peace and tranquil of Llangollen. The lounge has a warm vibrant feel, with a grand fireplace, open fire radiating into the room giving a peaceful yet cozy feel. Perfect relaxation after a long day walking in one of the most beautiful places in the north of Wales. 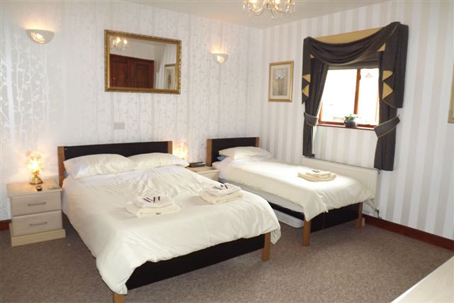 One of the many guest rooms, this picture shows a family room, Hillcrest offers double family rooms, all of which have en-suite facilities, colour televisions and complementary tea, coffee and biscuits. Rooms start at £60 per night. Access: Side access to rear car parking facilities, approximately 70 metres walk back to front entrance. Front entrance door approached by two stone steps to pathway and three stone steps to door. Width of porch and front door 3 ft. Stairway to rooms- 13 steps to first landing and rooms, followed by a further 4 steps to rooms. 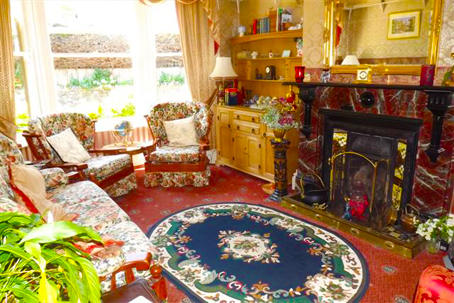 Ground floor bedroom available, same level as breakfast room and residents lounge. Please be aware that Hill Crest Guest house operates a strict no smoking policy.